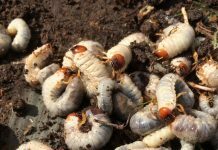 Producers should ask what kind of salad does my livestock want? REYNOLDSBURG, Ohio — Developing quality pastures, sharing insights from one producer to another, and the latest forage research were all topics at the Ohio Forage and Grasslands Council conference and annual meeting Feb. 3. 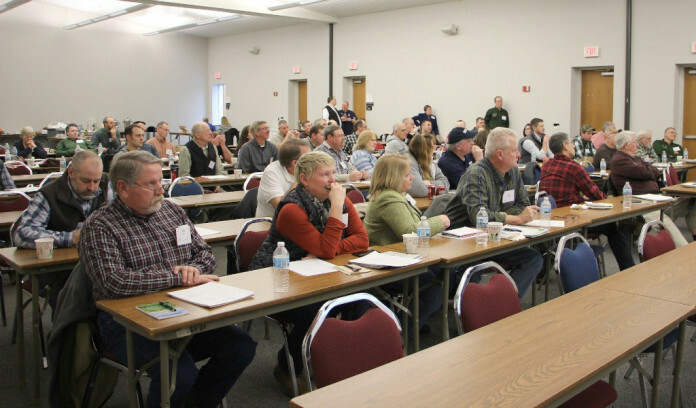 Producers from around the state heard from forage experts from Ohio State University and Michigan State University as well as from fellow producers who have found their own niches in grazing livestock. 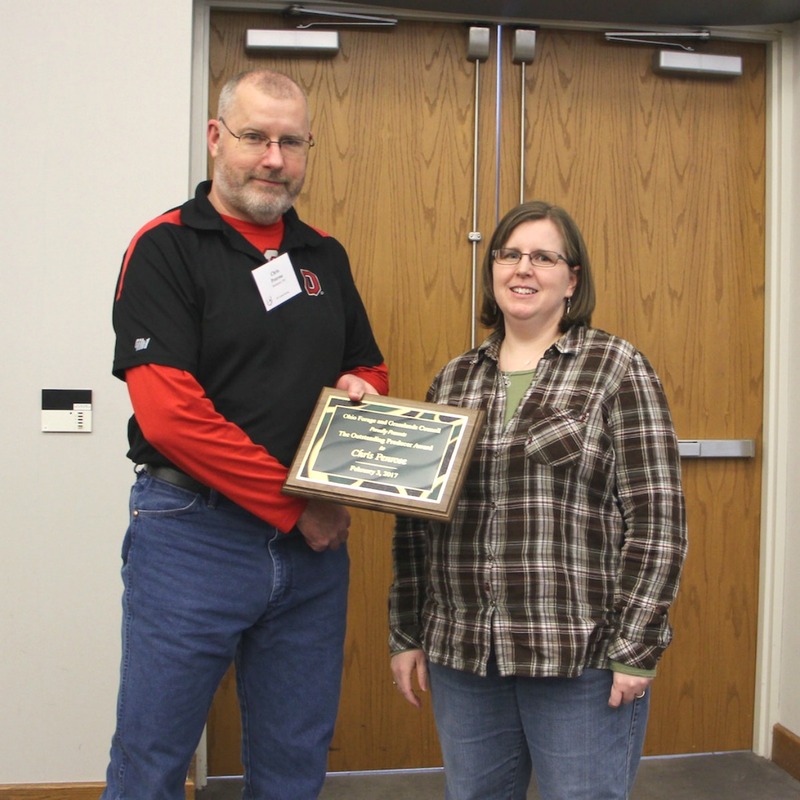 Chris Penrose was named the Outstanding Producer of the Year during the Ohio Forage and Grasslands Council’s annual meeting and conference. Council President Megan Burgess presented the award. During the annual meeting, awards were presented for top producer, distinguished service and leadership. The Outstanding Producer Award went to Chris Penrose, the Jack Tucker Distinguished Service Award went to Gene DeBruin, and the Bob Evans Leadership Award was presented to Gary Wilson. Sometimes it takes a little creativity and determination to make a farm enterprise work. Jeff Ramseyer, a livestock producer in Wayne County, formed a partnership with an organic grain farmer in his area in the fall of 2014. “We (Jeff and his wife) had a great desire to graze livestock and the grain farmer always had a desire to raise cattle,” explained Ramseyer. 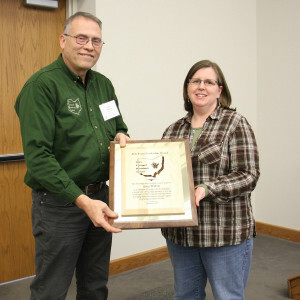 After several failed farming lease agreements and partnerships, the Ramseyers connected with Dean McIlvaine through the Organic Valley co-op. The synergistic partnership works because the grain farmer needed the fertility but had little access to labor to raise the cattle, he said. Ramseyer could provide the cattle, and the labor (all with his family) and work with the grain farmer to enhance land not suitable for grain crops with cover crops and other soil enriching forages for his cattle. The livestock can also be easily rotated to any field to match the needs of the grain farmer’s crop rotation. Ramseyer has around 200 head of cattle and has started to incorporate sheep and hogs into his organic grazing system. One of the things he enjoys most about farming is the ability to do it with his family. Lin Karcher and her husband, Eric, purchased a 340-acre dairy in Meigs County, and are working to transition their 200 head of Jersey crosses to a 100 percent grass-fed operation by this fall. 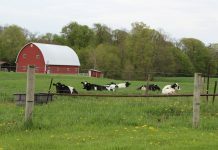 They have already found a niche specializing in A2 milk, which is sold to Snowville Creamery, but the decision to transition to grass-fed is in direct response to the market. Karcher claims grass-fed milk and dairy products is the fastest growing sector. By eliminating grain, Karcher knows a grass-fed operation will mean more management, but it will also allow them to maximize the use of the land and facilities they already have available and simplify in other areas. Todd Hager and his son, Jacob, run a commercial hay operation in Allen County. They farm over 2,000 acres and can produce around 13,000 mid-size square bales off the land. All hay is sold, except for a small amount they set aside for their small dairy operation, explained Hager. And their hay is mostly sold by the ton. Along with selling to the traditional livestock operations — horse, cattle, goat and sheep owners — Hager said they have sold to some unique customers raising reindeer, elephants and even one who wanted to feed a large land turtle. The most challenging part of the hay operation is finding the time to get it all done, Hager said. Gary Wilson was awarded the Bob Evans Leadership Award during the Ohio Forage and Grasslands Council’s annual meeting and conference. 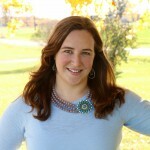 Council President Megan Burgess presented the award. Kim Cassida, a forage extension specialist from Michigan State University, shared her top 10 reasons why farmers should consider forage mixtures of grasses and legumes in their pastures. Some of the top reasons included improved soil health, better yields and improved nutrition for ruminants. Cassida also shared a research study using brassica-based forage mixtures as a finishing strategy for grass-fed steers. Brassica was used for its cold tolerance — a possible way to extend the grazing season — and its maximum potential nutritive value. The study also compared the Brassica diet to a traditional grass-fed diet (perennial pasture plus hay) and a traditional feedlot operation. Cassida’s study found that Brassica-based mixtures provide an acceptable finish for grass-fed steers at the Select level, but are not more productive than perennial pastures. However, Brassica finishing did increase dressing percentages, which resulted in greater hot carcass weights than the perennial pastures. A consumer tasting panel of the Brassica, traditional grass-fed and feedlot beef revealed consumers found little difference in flavor or juiciness between the different types of finishing styles. Among the many research projects in the works, Mark Sulc, extension forage specialist with Ohio State University, shared new research out of Brazil that takes a look at grazing from the animal’s perspective. Researchers in Brazil studied sheep and cattle grazing habits to determine the best grazing heights of different forages. They recorded the number of bites and steps the animal took in different heights of forages and determined the animal takes 50 percent of what is in front of it. Once the animal has grazed 40 percent of its grazing area, it starts to slow its intake. So, Sulc explained, if a producer can determine the optimal height of the forage before the letting the animal out on pasture, he can also determine the height of the forage when the animal slows its intake and leaves the pasture for optimal regrowth. For example, a research study conducted on tall fescue, a common forage in Ohio, found the animal should enter with fescue heights around 8 inches and leave at a height around 5 inches. Maybe the important question you should be asking is “what kind of salad does your animal really want?” said Sulc.